I had quite the nice surprise this week! I had planned to meet my mom at Bistro in Driftwood Plaza, but they weren’t open yet so we popped by next door to Chowder Heads for lunch. We sat outside near the courtyard which was nice as the weather was amazing and there is a fountain and umbrellas. Our server was Ken and he was beyond sweet. 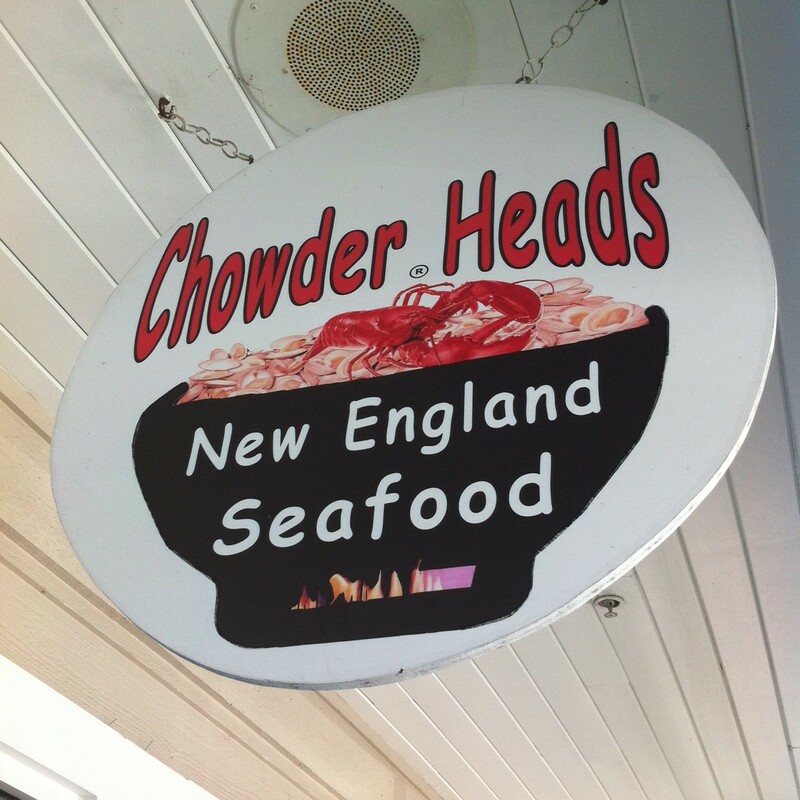 When we told him it was our first time visiting, he offered us a little sample of each soup, as that is what they’re know for (Chowder Heads… go figure). I have to say that this was a great idea as I loved them and will definitely go for a soup combo of some sort on my next visit. I am a total sucker for a good Lobster Roll, so I had to order one – Southern style in butter, Northern is where it’s more of a lobster salad. It was everything I wanted it to be. The roll was packed with lobster meat and the bun was toasted with butter just the way I like it. I had it with a side of their Potato Salad which was really good. I don’t normally like white potato salads, I’m more of a yellow Southern style girl, but it had nice flavor and a good texture with big chunks of potato. My mom went with the Shrimp Roll, Pan Seared versus fried. I loved the way they prepared their shrimp roll. Around town I typically see the tiny shrimp salad concept which is not my favorite whatsoever. This roll had jumbo shrimp beautifully seasoned and seared in a crisp buttered and toasted bun. I have to try to recreate this thing at home… and then end up at Chowder Heads anyway. She went with the Onion Strings, which was a mountain of thin onion rings that came with a spicy dipping sauce – yum. Back to the soup though! We were clearly the newbies as the regulars piled into the tables around us and all seemed to order soup – totally rare for a warm South Florida day. But I don’t blame them. The Lobster Bisque was delicious! It was creamy with little chunks of lobster throughout and a beautiful color. The Manhattan Chowder (red) was the underdog for me and I was shocked how much I liked it. It had nice spice to it and was the perfect consistency. I’ve always been a New England Clam Chowder (white) fan, which theirs is also super yummy. I also tried Rhode Island Chowder for the first time. I had never heard of such a thing. It looks like chicken noodle soup in the bowl and apparently is based off of a Portuguese recipe? It was much more brothy than the others and tasted more of the clam. 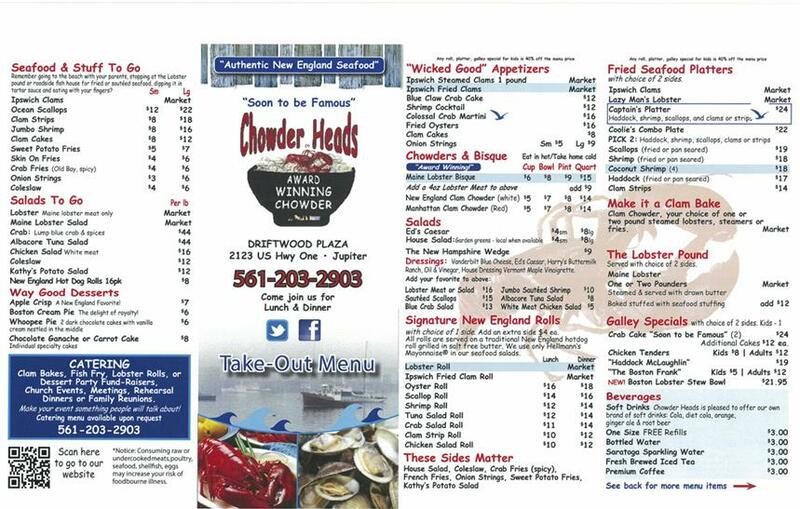 I think I still couldn’t get past the fact that there was a chowder I had never heard of.. I am so glad we ended up trying this place out. The food was awesome, the service was with a smile and they also had a market where you can grab goodies to go – including the apparently locally famous soups. This is the owner of Chowder Heads. I would like you to know that we have a new and better menu. I added things like lobster scampi and Alfredo. Lobster pie is a real hit and so are the spiced shrimp app. WE have been named the 2014 and 15 lobster roll champs. Please come visit us again we love the way you write about restaurants.